Most companies like to provide a pleasant working environment for their employees. Of course we all want a motivated and happy workforce. So how can a coffee machine help? We all know that we are supposed to take short breaks in our work in order to be more productive. Refreshments such as coffee and tea act as a pick-me-up that can revive flagging spirits. The occasional short break to enjoy a drink can also boost productivity. Most studies into workplace drinks have shown that they can be great for reducing stress, recharging batteries and putting workers in a positive frame of mind. Overall it can help to improve the satisfaction levels of the staff, making them more alert, motivated, and productive during the working day. If you don’t provide the refreshments, the chances are your workforce will pop out of the office to get their own drinks and snacks throughout the day. Leaving an office, queuing, being served, then returning from a coffee shop can take up to 20 minutes at a time. A visit to a vending machine or kitchen in the workplace will get an employee back to work again with less time lost. Coffee is packed with antioxidants and nutrients that boost health and wellbeing. Coffee can also lessen the risk of certain diseases such as diabetes. Instead of the immediate gratification of a fast food snack, making a hot drink takes a few minutes. The process of making and drinking a cup of tea or coffee makes us slow down and gives us time for a much needed pause. A small amount of caffeine and hydration also provide health benefits. It’s a known fact that coffee machines create sociable situations and a more relaxed working environment. The mood in the workplace impacts staff morale and motivation. In addition, coffee has a strong stimulant that fights off sluggishness, heightens mental alertness and boosts endurance. 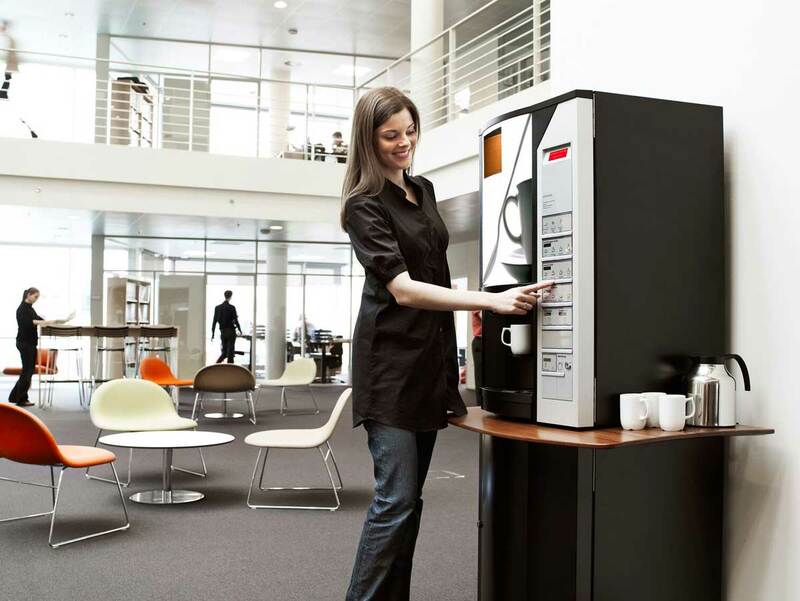 Overall communication can be improved in the workplace thanks to the humble coffee machine. Offering work benefits is a great way to help retain staff loyalty and providing hot beverages for free is a great benefit for your staff. Most people would agree that benefits such as free coffee show that an employer is concerned about the welfare of their staff and wants to keep the working environment a comfortable place to be. There are many businesses that come face to face with customers on a daily basis or that will have people waiting as work is done such as car dealerships, garages etc. In this instance having coffee available is also a benefit to customers and most will see it as an act of courtesy to be offered a beverage as they wait. This can help show a company in a good light and may even make it more likely that a customer will deal with them again. Individuals being offered the chance of employment can also see this as they are being shown around and while it is obviously not a major reason for accepting a job, small perks such as coffee can help tip the balance in a company’s favour if they are competing for workers. Having a coffee machine creates an overall good impression. If you expect quality results from your employees, it is important to give them quality too. What you put in, you will definitely get back. When a quality coffee machine is installed in the office, you will notice that employees feel appreciated and cared for and will give the very best to their tasks, which ultimately benefits your company. Discover more about our premium coffee brand, Expresso Coffee. ⟵Calling all coffee lovers this Valentine’s!